Composite image of Saturn shows the entire planet, including the rings as seen by NASA's Cassini spacecraft from the south. The green glow represents aurora lights. Full Story. Earth isn't the only planet in the solar system with adazzling northern lights show. A new video from Saturn shows spectacular auroraon the ringed planet, revealing new details about how the phenomenon works. "Cassini's instruments have been imaging the aurora inmagnificent detail, but to understand the overall nature of the auroral regionwe need to make a huge number of observations -- which can be difficult becauseCassini observation time is in high demand," said study leader TomStallard of the U.K.'s University of Leicester in a statement. "However,there are VIMS observations of numerous other scientific targets that alsoinclude auroral information. Sometimes the aurora can be clearly seen,sometimes we have to add multiple images together to produce a signal." As a whole, the collection of observations should help buildup a better understanding of howauroras happen across the solar system, he said. Stallard will present preliminary results from his study atthe European Planetary Science Congress in Rome on Friday (Sept. 24). In the new Cassini video, the aurora can clearly be seen tovary significantly over the course of a Saturnian day, which lasts around 10hours and 47 minutes. On the noon and midnight sides (to the left and rightrespectively) the aurora can be seen to brighten significantly for periods ofseveral hours, suggesting the brightening is connected with the direction ofthe sun. Other features can be seen rotating along with theunderlying planet, reappearing at the same time and the same place on thesecond day. This suggests that they are directly controlled by the direction ofSaturn's magnetic field, researchers said. As with Earth's northern and southern lights, the auroras onSaturn are created when solar wind particles are channeled into the planet's magneticfield toward its poles. There, they interact with electrically charged gas(plasma) in the upper atmosphere and emit light. However, aurora features on Saturn can also be caused byelectromagnetic waves generated when its moons move through the plasma thatfills the planet's magnetosphere. To date, Stallard and his colleagues have investigated some 1,000images from the 7,000 that Cassini's VIMS instrument has recorded of Saturn'sauroral region. 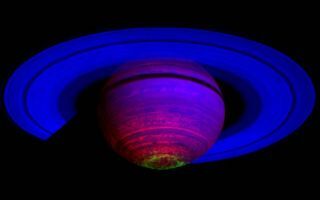 "Saturn's aurorae are very complex and we are only justbeginning to understand all the factors involved," Stallard said. "This study will provide a broader view of the wide variety of different auroralfeatures that can be seen, and will allow us to better understand whatcontrols these changes in appearance."